Scavenging resources in a wilderness survival situation can turn up life-saving stuff. That’s why developing a possum mentality is vital! Our ancestors walked our woodlands and learned to use the resources most modern outdoor enthusiast overlook. Essential woodland resources seem to be invisible to the modern eye. The stuff you’ve got packed in your woodcraft/bushcraft kit or bug out bag are consumable. You’ll eventually use up that roll of duct tape… or, more than likely, you forgot to pack it. Not a problem. Pine trees produce a sticky substitute with superior benefits! Pine trees secrete resin as a defense to close wounds from insects or other forces. The sap provides a protective layer or sealant over the injury . The sap hardens forming an amber glob which turns dark in color over time. On fresh wounds, you’ll notice a whitish layer of sap covering the damaged area. With time, large clumps form making it easier to harvest. Harvesting fresh resin can become a sticky situation. The fresher the glob, the more sticky and pliable. On dedicated Jewel of the Woods harvesting trips, I carry a grub knife, one I don’t mind getting covered with resin. To remove sap from my good blades in the woods, I use a bit of Everclear (190 proof) from my flask on a piece of cloth. For hardened resin, poke a sharp object (grub knife or sharp stick) into the base of the glob and pry it loose. It’ll break off and fall into your hand or container underneath. That’s when you’ll notice the crystalized form inside which resembles a beautiful piece of amber stone. For hard-to-reach spots high in trees, my friend Joe at Feral Woodcraft shares his clever resin harvesting tool. Now that you’ve gathered a fair amount, what’s this sticky stuff good for? Treat wounds – apply it to cuts like you would super glue. Follow first-aid protocol for cleaning/flushing first. Stop bleeding – apply a soft glob (heat if necessary) to help stop bleeding. Treat skin rashes and eczema with ointments,tinctures, and salves. For tinctures, use 190 proof Everclear since resin won’t dissolve with watered down alcohols. Chew softer sap straight off the tree like a gum for sore throats and colds. You could pre-make “gum” with these ingredients: bees-wax, pine sap, and honey. Turn pine resin into pitch sticks. Hafting arrowheads, fletching arrows and gluing other primitive tools and weapons. Waterproof boot seams, canoes, and containers. Patch holes in tents and tarps. Pretty much any thing you need to glue or patch in the woods, pine pitch is the product. Place globs of dried resin in a fatwood torch to extend its burn time. Pitch sticks, described above, can be used as a makeshift candles. Melt sap and soak a cotton bandana or rag wrapped around a stick for a torch. 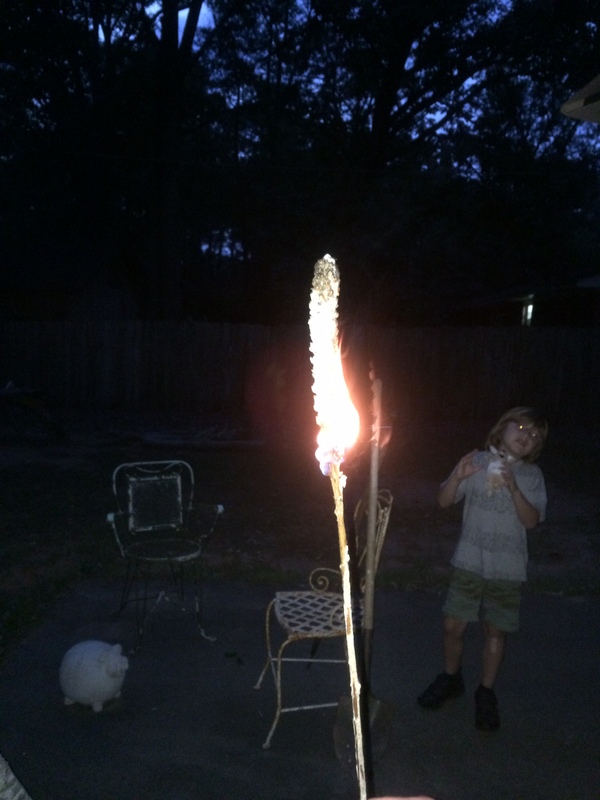 Melted or liquid sap poured over a dried mullein stalk works as candle/torch. Fire is life in a wilderness survival scenario. Even on weekend camping trips, fire offers core temperature control, cooking, and hot cocoa! 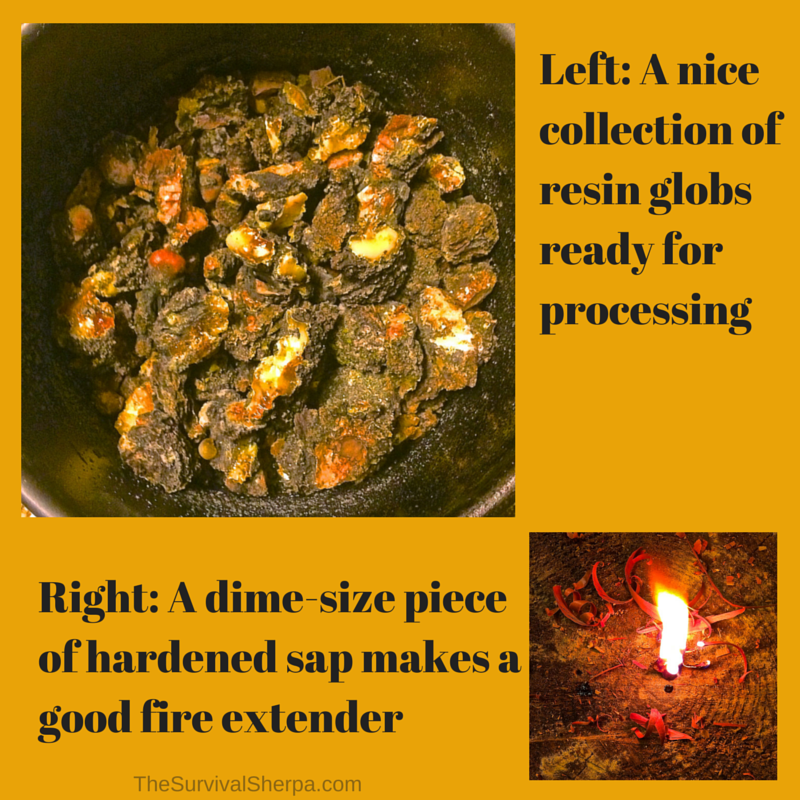 Resin is your secret weapon to starting and keeping a fire going in wet conditions. Anyone who’s used resin-rich fatwood in rainy conditions appreciates its important role in fire craft. Resin is highly flammable. Once lit, you can dry marginal tinder and small kindling. Harvest liquid sap into a container from a fresh cut in a pine tree to add to a makeshift torch. Secure the container under the exposed bark to collect the sap. Use this liquified sap as torch fuel. Once you learn to identify this sticky life-saver, you’ll find it difficult to walk past a pine tree without scanning for this Jewel of the Woods! Great tips! Here’s just an editing note though…..ointments, tinctures, and slaves? HAHAHAHAHA, that was just too funny! That happened before on a post about Black Seneca Salve. Thanks for catching it Doug! Another page of Todd’s that i will be saving for future reference. Thanks man. Here in the north of Sweden we make a traditional healing salve from fir tree sap and tallow. Great stuff for healing deep, infected wounds. I’ve used it successfully, but nervously, on a bone deep, infected operation wound to my knee that wouldn’t heal. It’s gotten to the point where I hardly ever return home from a trek in the woods without a clump of sap. Thanks for sharing your experience with us, Lisa! Lisa how do you make the salve and use it on a wound? My husband collects sap for fire starter, he will be pleased to know its medicinal properties as well. Thanks! Many thanks for your kind words, Jim! I really appreciate it! 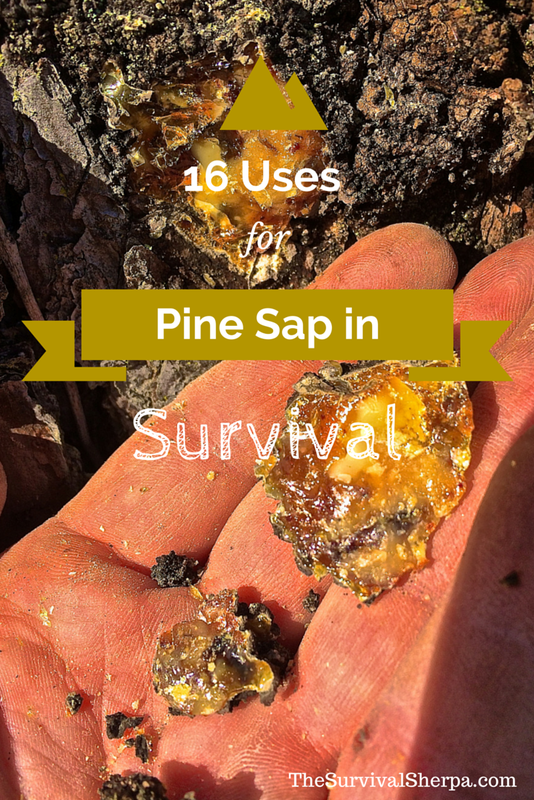 That pine sap is such a great resource to collect and use. And those tins, I collect them to use for all sorts of things. Containers aren’t given a second thought until you don’t have one. Keep Doing the Stuff of Self-reliance! Welcome to the journey to self-reliance, Carol! So happy to hear you’ve gotten started and you found this info helpful. Keep in mind, in a true survival scenario, I’d drink untreated water to avoid dehydration. Most symptoms show up over 72 hours later. The typical lost hiker or hunter is located within the first two days or so. Keep doing the stuff, Carol! I was always getting stung by hornets when i was young, and that stuff works great, pull the stinger out too if you use a bandage over it for 24 hrs. Can be used to remove slivers as well. Soften and form over the embedded sliver. Allow to harden then pull away. Got this from Michael Moore’s Mountain West herb book. Pingback: Kako odstraniti smolo z avtomobila? I’ve never attempted a water vessel. Sounds like a great project! I would think you’d need something stronger to hold the plywood together. Batches of pitch glue can become brittle if the right ratio is not there. Scott Jones, my primitive skills mentor, mentioned once that sweet gum sap in the mix makes it more pliable. I know that’s not much help. It’ll be interesting to hear what you come up with for adhesive. Keep us posted, please sir! Hello, and greets from the middle of the Great bear Rainforest…. In this area we can gather and even tap resin. I’ll try the borehole method because it’s standardised and known to cause minimal insult to the tree, and yields a clean stream. I’m wondering what you can tell me about using the Woodpecker method to induce some resin flow that we can let dry and go back and snap off the bark later as it dries into short strands and small globs. There’s plenty of ground here that won’t grow a straight board but is wonderful open exposure for a resin tree. Ah, didn’t know that one. Thanks for sharing with us, Michael! Actually the sap is rosin if it’s purified. Being rosin it’s a soldering flux, keeps oxide of metals won’t deteriorate metals. Thanks for that info. Good to know! I do believe the different coloration comes from the different ages of the resin. A lot of white I find is very brittle and not very useful in the process. The best I’ve find is the orangeish, softer resin. It may have to do with your location as well. I just climbed a pine tree. It’s was really cool and the wind moved me and the tree around. It was a great experience with all that including climbing to the top and going back down. I then realized after a minute that pine sap was stuck to my military tight long sleeve shirt. So I’m here and really interested in all these cool survival tips with pine sap! If you want message me back some info and I would like to see more unique ideas of survival tips with pine sap! This is really interesting to me and like it a lot! Lots of good stuff. Just one more thing, it is also good for patching tires. Went for a 4 day hike and someone iced picked all 4 tires. I used welding rod stubs and pine tree sap to plug the holes and drove home, it also helped to have a 12 volt air pump. If you would be so kind.Can you please site your sources I’m kind of desperate to know how reliable these information are for research purposes. Mostly from experience and wood and plant lore. Sorry I don’t have specific references. NICE NICE NICE THIS COULD SAVE MANY LIFES DIDNT MEAN TO RIME GLAD ITS NOT A CRIME:-)) NO really thank you very much helpful info. How do I remove it from clothing ? It is very sticky and my wife won’t let me use her washing machine ! I scraped most of it off but there is still deep set residue there . Thanks. Cold water and add a few drops of dish soap with laundry detergent if it is small amounts, if you have just small spots. Hey.. Thanks for sharing this great post. It’s very useful and straight to the point. I didn’t know that pine sap can be used for medical purposes. Very interesting.. I’l keep that in mind and if I come across a pine tree, I’ll be sure to try to do some experiments with the guidelines you mentioned here XD. It’s important to familiarize ourselves with any survival skills as preparations. We can’t predict the future. When speaking about survival, it reminds me of one of my favourite survival book. It’s really easy to understand and very useful in so many ways. It contains so many survival guides that most of us don’t even know of. My favourite part of the book is that it helps the readers to learn making their own medicine using medicinal plants that most of us don’t even know that it can be use for that purposes. The book teaches how to identify and prepare the plant for medical uses. But that’s just a small part of it. There are so much more survival guidelines in that book. Turpentine is made from pine stumps. I find what we call fat pine for fire starters. If you see a rotted pine stump , they will usually have fat pine. I have a couple chunks on the hearth . Awesome, can this work with Scots pine too? Is it any type of pine? Not sure. We don’t have Scots pine in our area. Fantastic reading. Just thought I would add a little humor. I was introduced to Ponderosa Pine pitch in 1935. My mother took me to one of the hugh, well 24 inches was hugh to a five year old, pines in the area where we lived in northern Idaho. She explained the difference; real good, medium soft/hard and very hard. The very hard ones were about the size of an adults little finger tip. “Clean off the loose stuff, put it in your mouth and let I soften and start chewing. Only chew the hard stuff.” It was great. I loved the smell. Still do. So when I introduced my children to chewing pine pitch, I told about my lesson. Many thanks, Linda! Appreciate the feedback. How long could you store the pine sap for? And would you just store it in an air tight container?